Ringsted is a city in the centre of Sjælland, Denmark’s largest and most populated island. 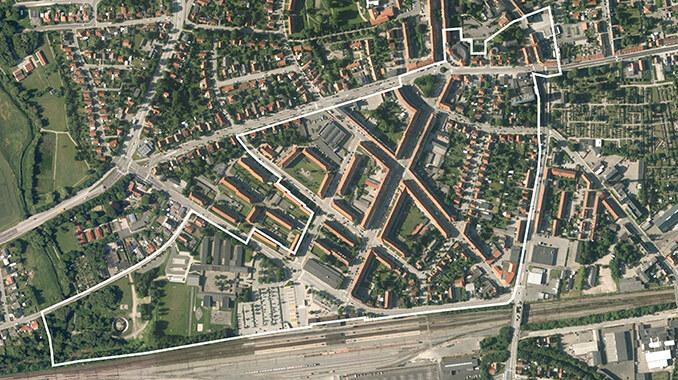 Its central position and the proximity of Copenhagen make it a popular place for commuters. The city attracts people who want to be close to Copenhagen but prefer a more relaxed small scale setting. The city is known for its big outlet centre and its historic centre. Together with the station area they form an ‘urban ribbon’, a connection of different programs and a sequence of public spaces. The station square is one of these public spaces. Located on a lower level it collects water from the surrounding district when a cloudburst hits the city, causing flood problems in front of the station. 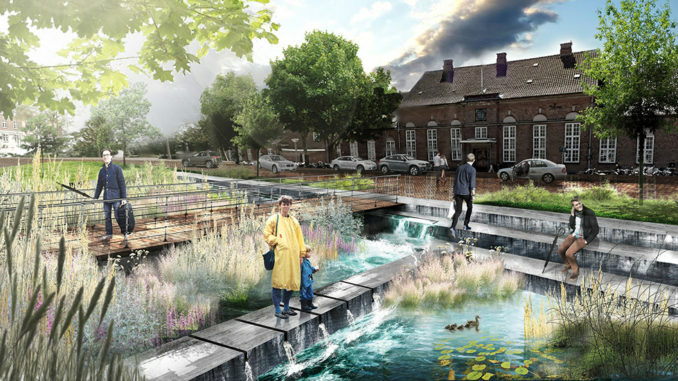 The municipality of Ringsted and the local water company joined forces and set the ambition to solve the stormwater problem and relate it to an improvement of the public space. The renewal of the sewage system creates a great opportunity to combine stormwater management with the beautification of some of the main public spaces. 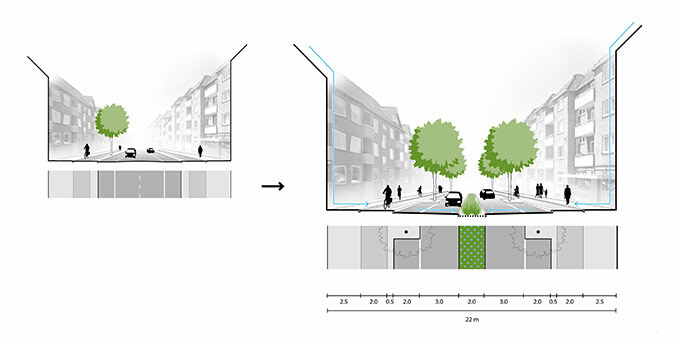 In a collaborative process with water engineers of Envidan we propose a strategy for stormwater management that utilizes the cities natural topography and local characteristics of places. 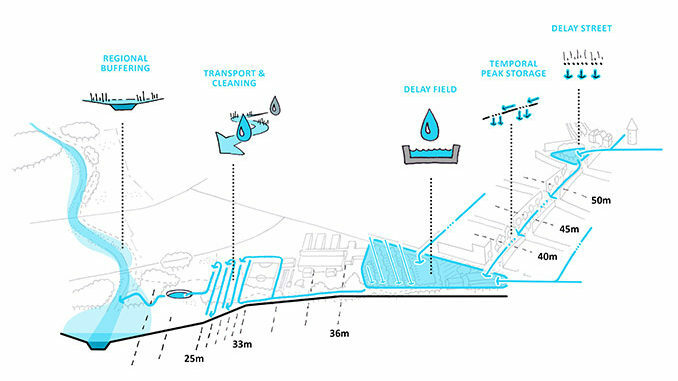 We introduce a water cascade of delay, peak storage, transport, cleaning and regional buffering. 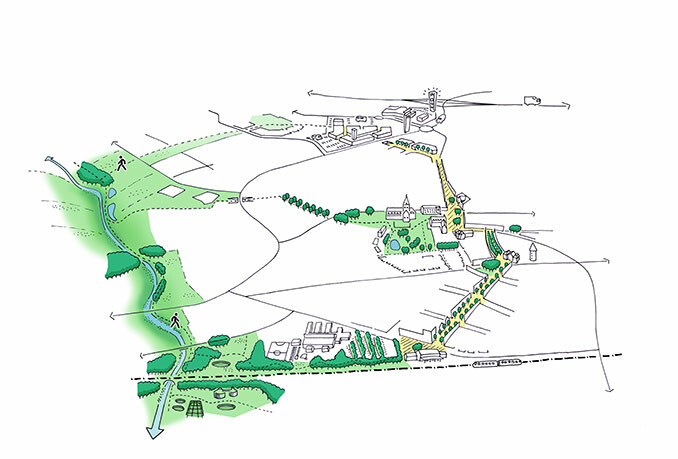 Hereby we see an opportunity to connect the urban ribbon to the surrounding landscape in which the local stream serves as regional buffer space as well as a recreational park for future urban expansion. Solving the stormwater problem creates the opportunity to improve some of the cities main public spaces along the ribbon. The station square transforms into a green welcoming place. Here a rain garden serves as central peak storage. An overflow directs the water into green water chambers, positioned beneath the bus platforms. The large parking site next to the bus station collects water from a second water catchment area of the district. Here the water is guided into green bio swales. In case of serious cloudbursts, underground raincrates answer to the requested storage capacity. Sjællandsgade is the main street connecting the station square with the historic centre. This street transforms into a green, attractive route. New commercial activities at the cross sections serve as programmatic stepping stones from station to city centre. We tested and valued different options of organising the street profile, giving the client an insight in the pros and cons of each option. 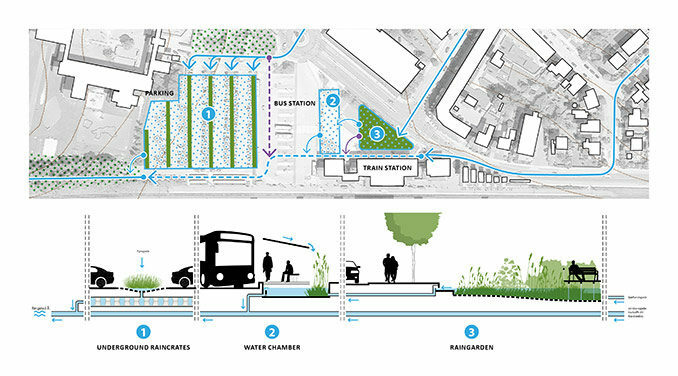 The preferred option shows a symmetric profile with a central green bioswale, delaying the rainwater in the direction of the raingarden in front of the station.